Creating a new website has never been easier with Free WordPress themes. There are numerous themes available on WordPress which are free to use. Doesn’t matter if you’re a blogger, a business owner or an online retailer, it’s easy to find a stylish, unique, and high-quality responsive theme for your website. Today WordPress is the most preferred CMS platform on the web. 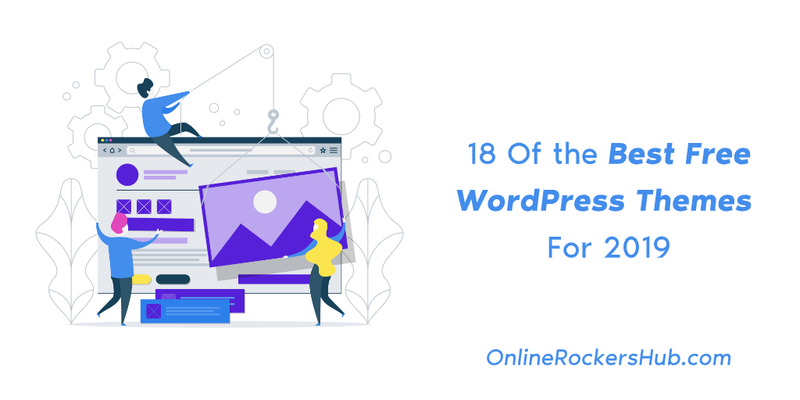 With WordPress, it’s easy and painless to develop a fully-functional website for just about any niche, including news, business, photography, and e-commerce. The wide selection of free themes on the market helps you to create a stunning website on the exact look, feel and design you have in your mind. In this article, we’ve hand-picked some of the best free WordPress themes you might want to consider for creating your website in 2019. Flash is an easy, flexible and developer friendly advanced free multipurpose WordPress theme. The theme lets you create any kind of layout you wish for and looks perfect on any device. The theme offers plenty of customization options so it’s easy to design a website for any niche. It has a Drag and Drop page builder, flash toolkit plugin, 6+ widget areas, 18+ custom widgets, slider and a lot more. 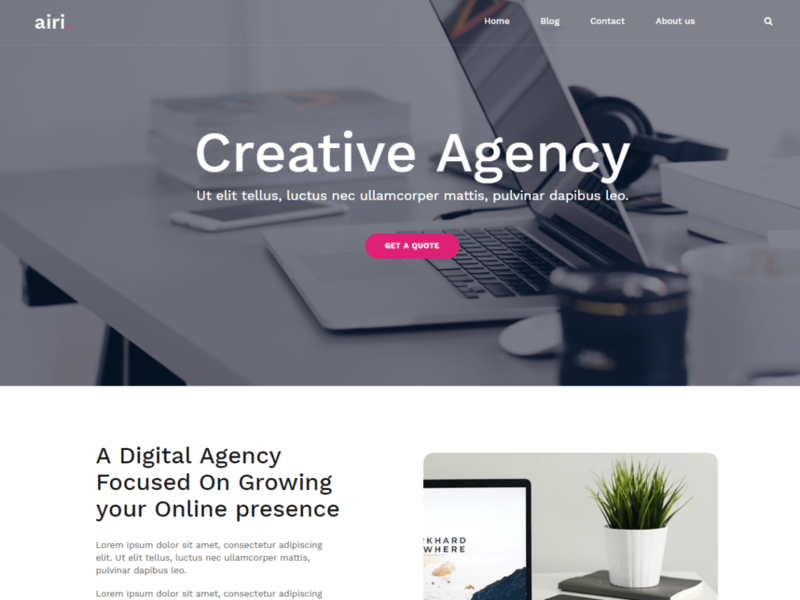 This multi-purpose WordPress theme is ideal for business, blog, portfolio, creative agency, food or for any other kind of site. It is a popular theme that offers unlimited possibilities and currently empowers 20,000+ sites. The Airi theme is ideal for small businesses, startups, agencies, and freelancers. Airi offers a wealth of customization opportunities. The elementary plugin can let you easily change all elements in the layout. A powerful theme customizer lets you change colors, set the fonts you want and a lot more. And the theme supports the hugely popular WooCommerce plugin, so selling your products online will be a lot easier this year. Included in every theme, a live customizer – to preview changes to your website in real time. Live browser support – to support popular modern popular browsers like Chrome, Firefox, and Opera. 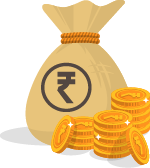 And fast support – to get immediate response for any queries related to the themes. 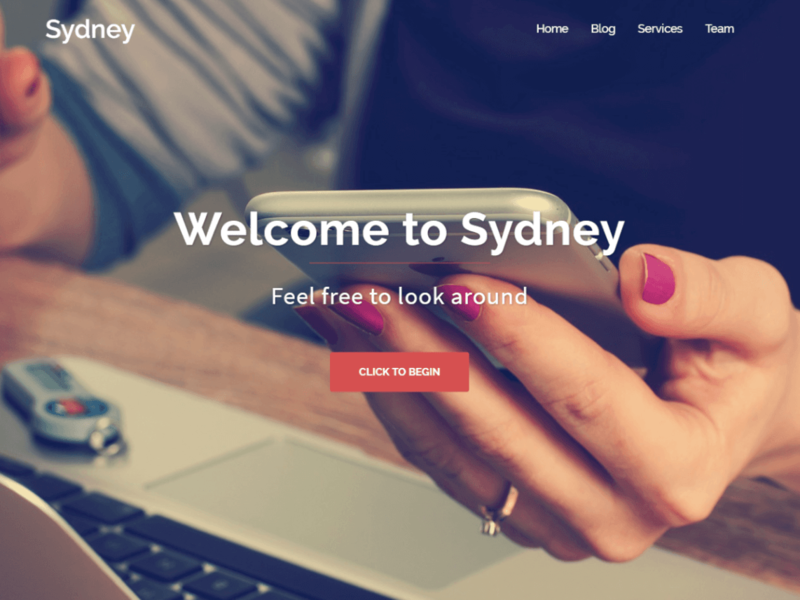 Sydney is surely a powerful business theme that provides a good opportunity for agencies and freelancers to create a solid online presence. It is a business-focused and highly customizable theme for everyday smooth operations of tasks. This theme provides a lot of customization possibilities. The theme incorporates a full-screen slider, sticky navigation, full-color control, layout control, and quick logo upload feature. Moreover, the theme offers top mobile responsiveness, good social icon integration and has full-translation abilities. Sydney has almost everything to develop and run an engaging professional website without any hassles. Neve is a super-fast, easily customizable, featherweight theme. It offers a fresh and eye-catching look for websites designed for entrepreneurs, small businesses, e-commerce shops, and personal portfolios. It has a quick loading speed and works perfectly on all different viewing devices. Also, Nerve has some top features which make it an excellent option to select. Its translation and RTL ready, completely SEO friendly, has a live customizer, offers 1 click updates and fast support, and comes with a powerful responsive user-friendly mega menu. On top of that, Nerve works perfectly with Gutenberg and other popular page builders. It’s simply a great choice for anyone who easily wants to build a beautiful website for free without any difficulties this year. If you want to run a fully functional e-commerce website that is highly responsive, modern and clean, then Shopera is just the right option for you. Shopera is a top customizable WooCommerce theme that is perfect for selling products online. Its mobile friendly design makes it great to operate on all mobile devices and helps to run day to day business operations quite smoothly in the palm of your hand. It’s a retail-oriented theme with ultra-responsiveness, advanced options, retina ready, translation and multilingual ready, which also gives you the ability to upload your own brand logo. 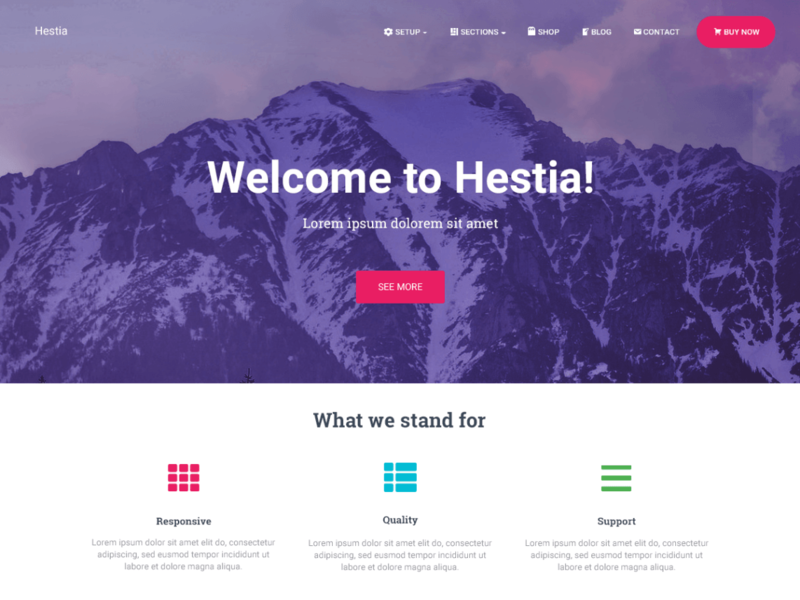 Hestia is the number one material design WordPress theme that is multi-purpose and highly responsive for startups. 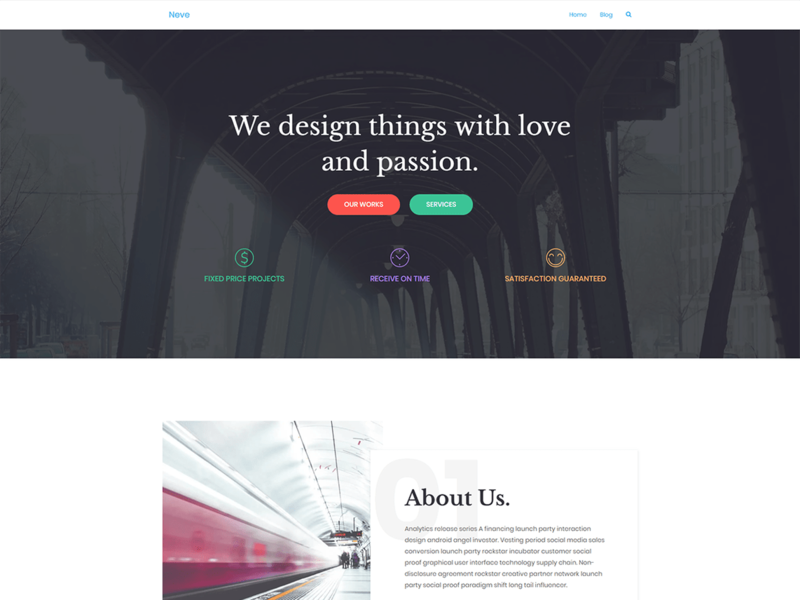 This is a clean, simple and beautiful theme that uses the latest design trends. It fits the needs of small businesses, online agencies, e-commerce, freelancers and perfect for restaurants, wedding planners, and sports shops. You can create an online store in a matter of minutes. It’s a simple and elegant look gives your online store a more appealing outlook. Hence, the theme makes your store accessible to everyone and can help to increase your sales. Well, you won’t need any coding skills. You just need to follow a few simple steps to create your own e-commerce website. 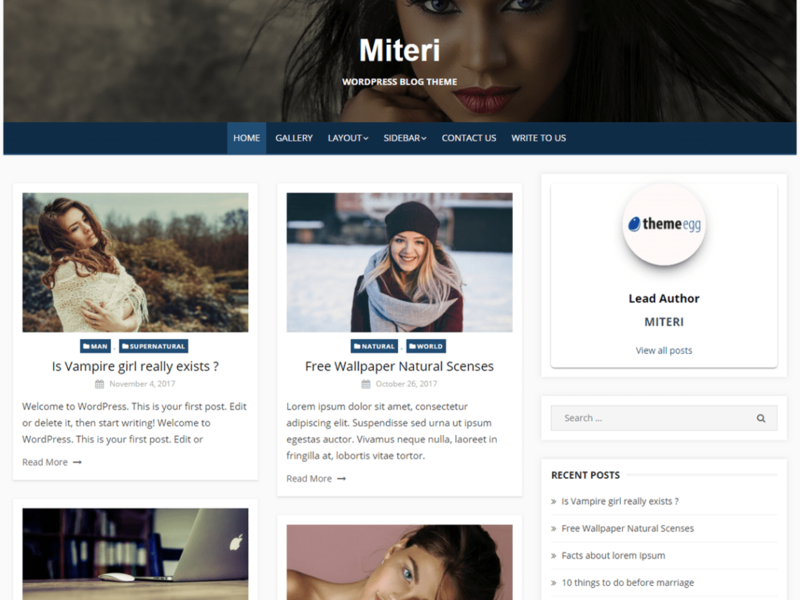 If you are looking for a clean and simple WordPress blog style theme with good customizable options then Miteri is just the right option for you. The theme is a perfect fit for blogs. The theme is highly customizable and SEO friendly. It gives different layout options, theme color customizations and font style changes and many more. Meanwhile, if you get satisfied with Miteri’s basic version and interested in the pro version. 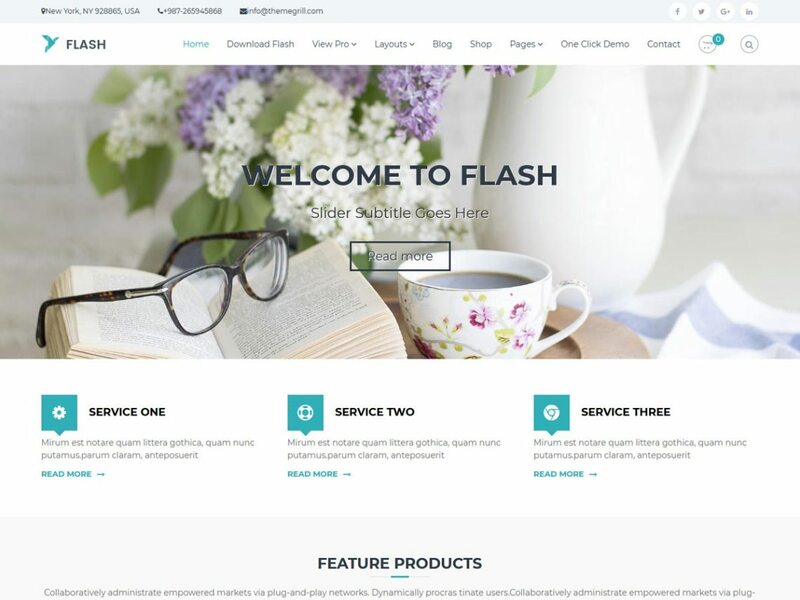 You can power your theme with these valuable features, including mega menu, social icons, WooCommerce support, RTL support, Featured Slider Widget, Instagram feeds, Masonry Grids, Page Builder Support, Multi-Layout option, and others. Fagri is a free one page WordPress theme suitable for an array of purposes. 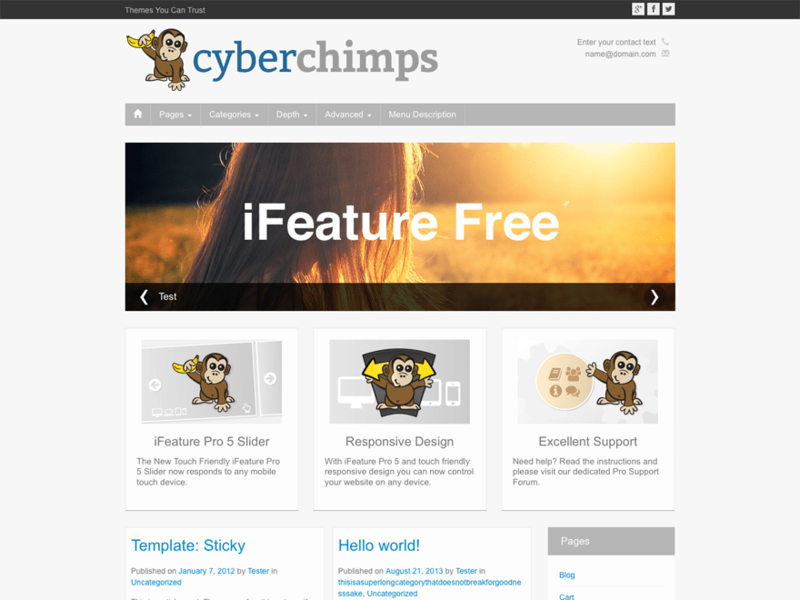 It’s an excellent and responsive theme, built to fit all your needs. The theme offers one-page design, along with a modern and elegant look that makes a perfect choice to run any different types of promotional campaigns for your business. Also, it runs well with the Elementor add-on. Meanwhile integrates pretty easily with WooCommerce plugin and offers smooth online retail operations. It’s is a fully responsive and super elegant magazine style WordPress theme. The theme is ideal for blogging, magazine websites, online news agencies and many more. Its touch-friendly drag-and-down elements allow you to create your own professional website in just a few minutes. iFeature 6.5 lets you create mobile-friendly websites that you can easily control from your IOs and Andriod run electronic devices. The theme offers a lot of customization with the appearance. From editing the design, blog, templates, header and footer options, and many more, there are a number of customizations you can do to create a website design that fits your need. 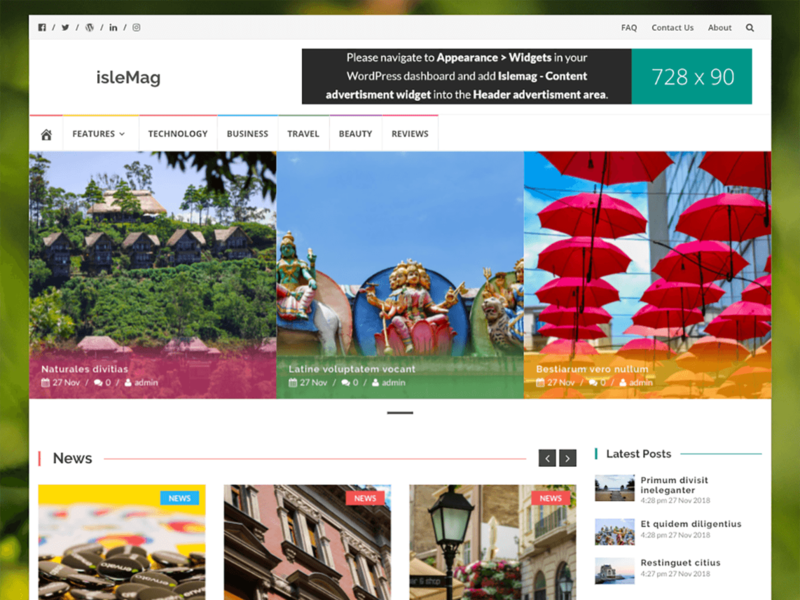 Released in 2016, IsleMag is a modern and beautiful WordPress theme, especially build for tech magazines, newspaper media website, and fashion blogs, or photography. The theme has an overall friendly and catchy design. It provides boxed layout, ad spaces, Google Adsense banners, a magazine homepage template, filtered categories, a live customizer and a lot of other things. Moreover, it allows you to add social links to increase visitor engagement with your content. And on top of that, it easily integrates with popular plugins like Jetpack, SiteOrigin page builder and contact form 7. 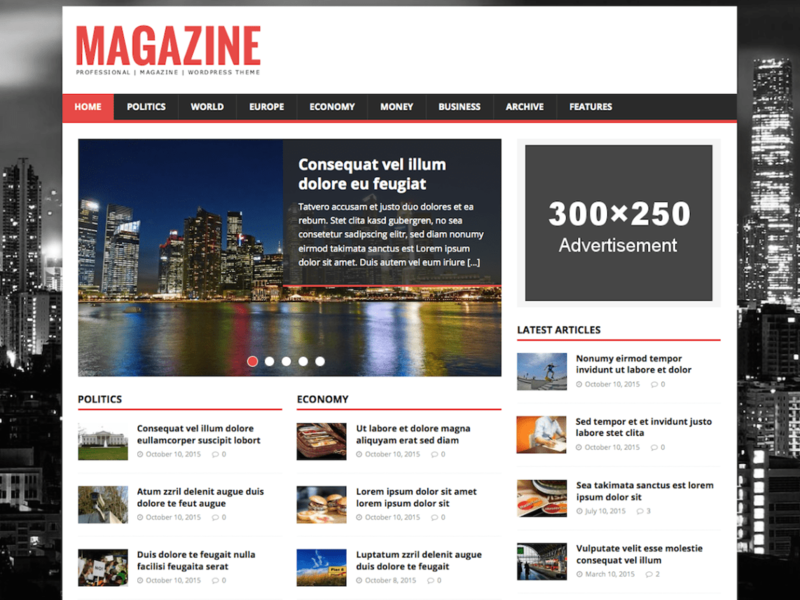 Yet another stylish free Magazine theme for WordPress! Installed at over 40,000 WordPress websites, undeniably it’s one of the most popular themes that support your overall magazine website. The overall design looks great on your desktops, laptops, tablets, and smartphones. This SEO friendly magazine theme is super-fast and ideal for niche likes fashion, travel, sports, international news, and politics. Though the free version of the theme has all it takes to develop a modern looking website. But with a premium version, you can unlock some outstanding new features and take your website to the next level. Download MH Magazine Lite Theme! 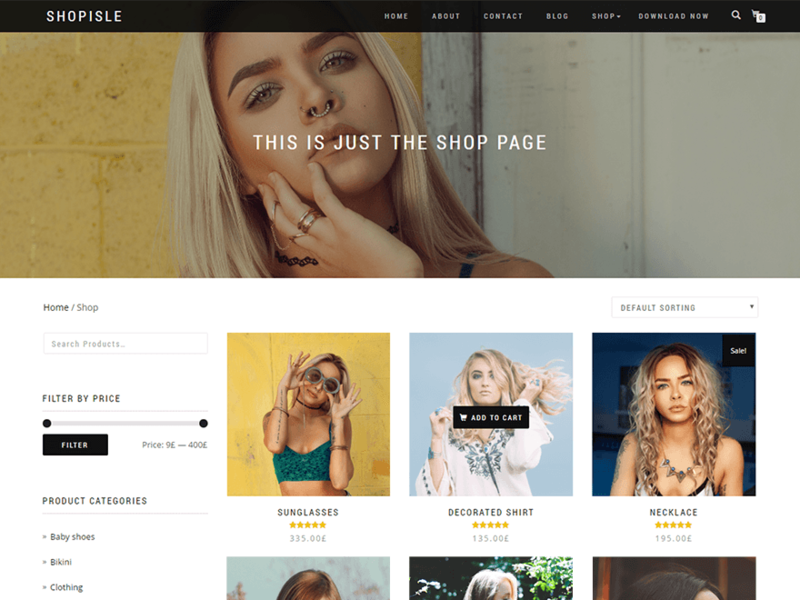 ShopIsle is an elegant WordPress theme for developing beautiful online stores. The theme comes with a full-screen slider and classy a layout to capture the attention of your potential customers in just a few seconds. The theme is perfect to design an outstanding WooCommerce shop for any kind of product you want to sell online. Also, ShopIsle is Woocommerce ready, has a responsive design, comes with an easy contact form and has an about us section that you can use to tell your audience all about your product, who you are, and what you love to do. Simply, it’s one of the best free WordPress them to create your own website today and start selling products. 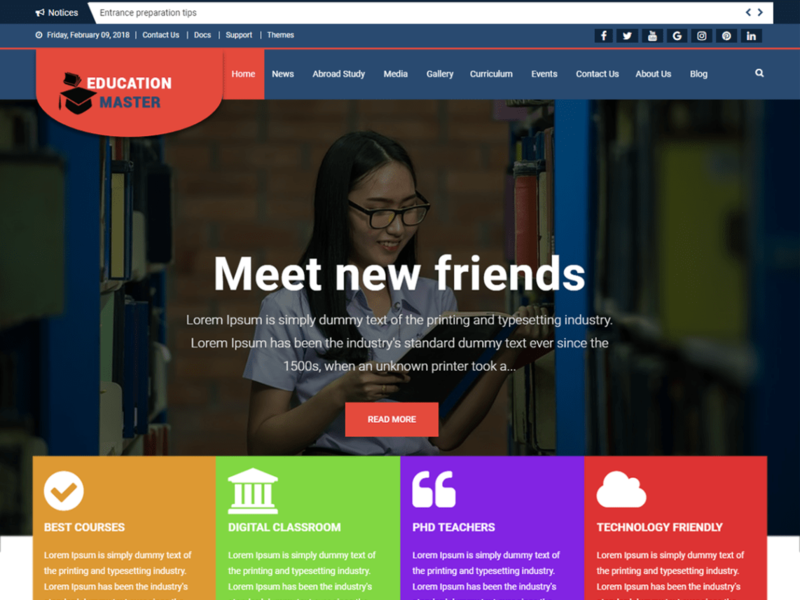 Education Master is one of the top free WordPress educational themes designed for university, school, college or other educational institutions. The theme’s beautiful and unique design is best suited for a solid web presence for all types of educational institutes. It has a fully responsive layout and along with perfect resolutions on desktop works, it works pretty well on all mobile devices. In addition, the theme is SEO friendly that makes it easier for educational institutes to rank well on the search engines when optimized well. With Education Master, you can create a beautiful education website and enlighten the world. 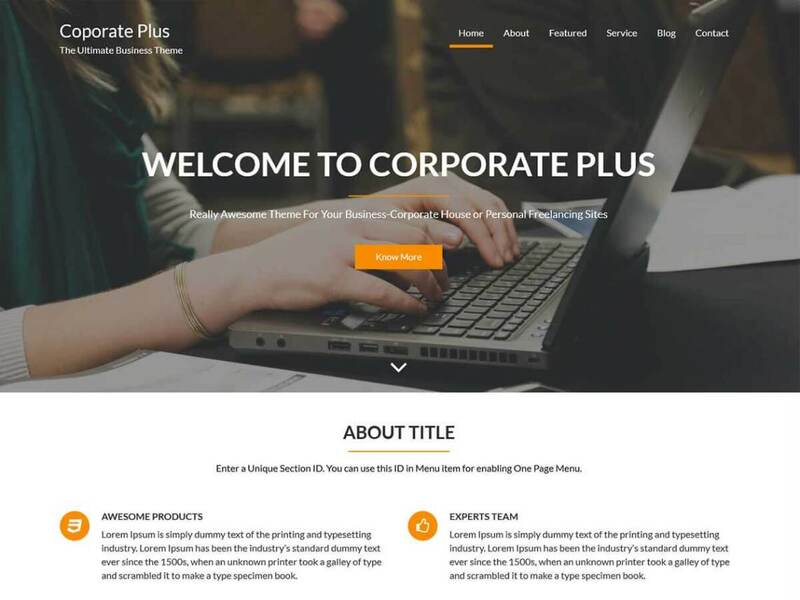 Probably Corporate Plus is the best free WordPress theme for small corporation and businesses that want to have a solid online presence. It is basically a simple, attractive and responsive theme with lots of customizations to help you strengthen your business presence online. It’s a one-page theme that includes a unique slider section, about us, feature, services, blog, and a contact section. In addition, Corporate Plus is a WooCommerce compatible, which means you can easily start selling your products after designing your website. All-in-all it’s an ideal WordPress theme for people to strengthen their online presence by spicing-up their site. 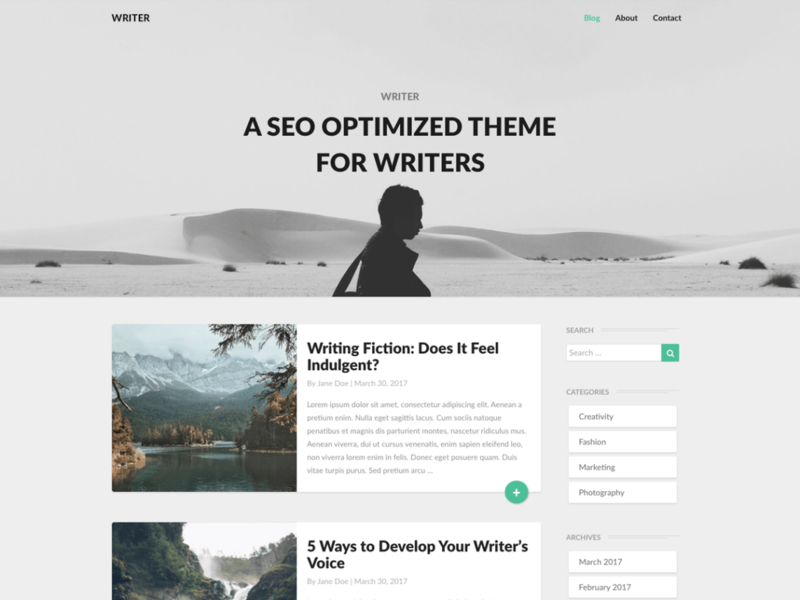 Writers is a fully responsive and impressive theme designed specifically for bloggers, journalists, and aspiring authors. Also, this theme is simple and easy to set-up that allows you to develop high quality multi-purpose blogging website. The theme has good features including, unique homepage, SEO friendly, translation ready and WooCommerce ready. Writers is a highly recommended theme for news magazines, affiliate blogging, creative portfolio, fashion, technology or travel. So, if you are a writer, author, blogger then the theme is perfect for you. Start developing your professional website with Writers today! 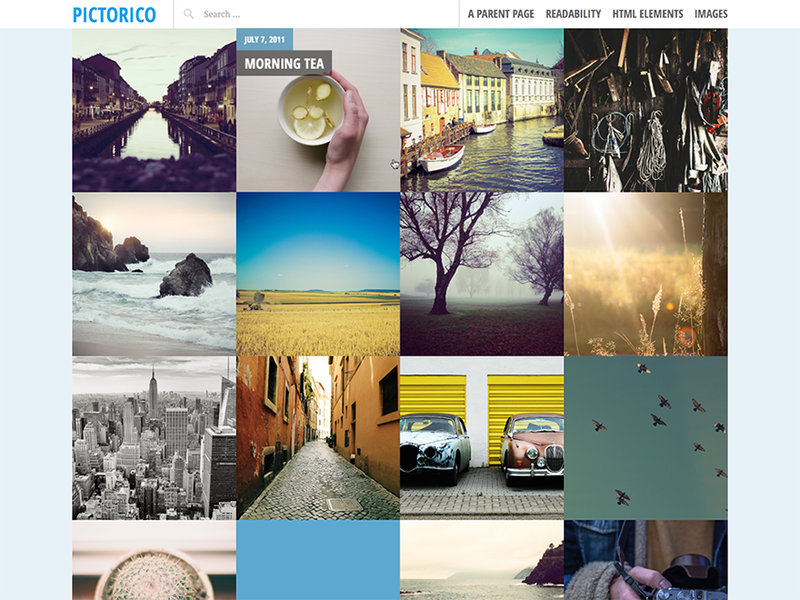 Pictorico is a theme perfect for photo blogging or a portfolio site. It is a single-column, grid-based theme with large featured images. The themes come with four widget areas that can be further customized as per your preferences. The theme support formats, including: Aside, Image, Video, Link and Quote. Also, Pictorico looks great when you assign featured images to each of your posts. It’s definitely a theme that you should use to display your artwork, designs, and products to viewers around the world. 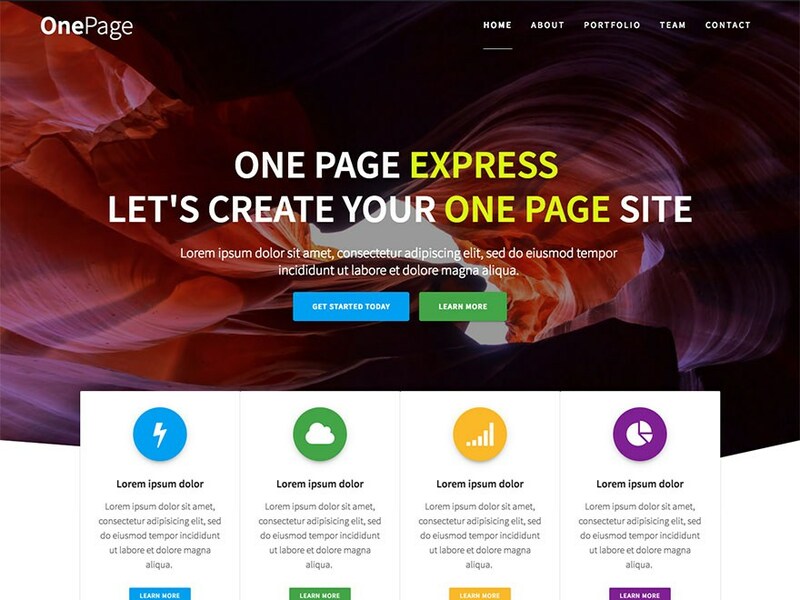 The One Page Express is often considered as the must-have one-page WordPress theme. It’s a theme that boosts your design powers with lots of customization options that helps to create a beautiful, unique one-page website in no time. One page express lets you combine design options like background overlay, media type, and others to help you set up a truly outstanding website to quickly catch your viewers’ attention. Download One Page Express Theme! 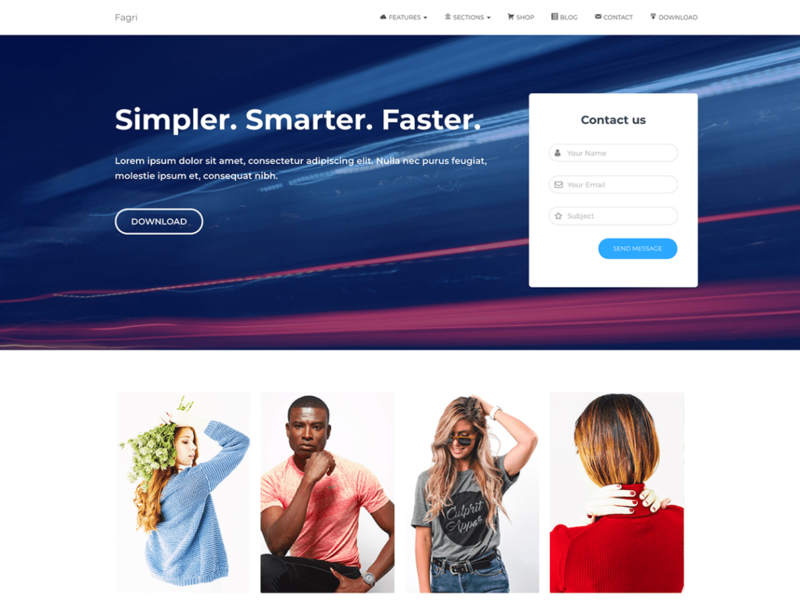 Virtue is a versatile and clean WordPress theme that can be used for simple portfolio sites or for a complete e-commerce site. The theme provides customizable header layout, boxed layout, cross-browser compatibility, font awesome icons and it’s completely translation ready. 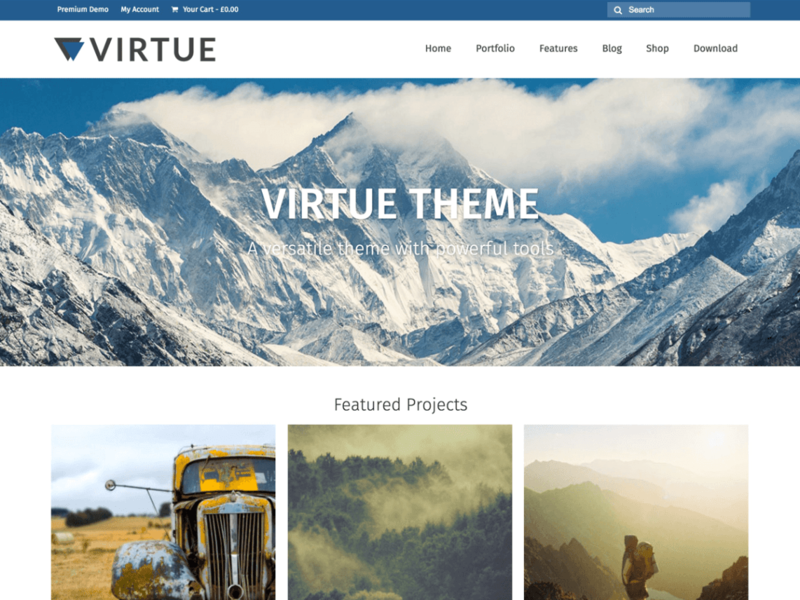 Virtue is a theme that is fully compatible with WooCommerce. Ready with all the tools and features you need to design an excellent online store. The best WordPress themes don’t necessarily come with a price tag. There are always a few free themes that can prove just as effective as premium options. You just have to pick up the right template that best fit your needs and start making a top website by yourself. We have highlighted eighteen of the best free WordPress themes to choose from this year, but the options are nearly endless. Note: This post on Best Free WordPress Themes was contributed by Kirsten Pike. If you have an interesting WordPress article to contribute, then check our Guest Blogging Guidelines.